Synthetic peptide from human XAF1. 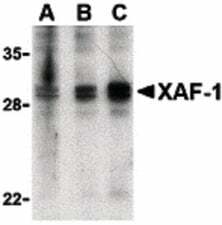 XAF1 antibody was raised against synthetic peptide from human XAF1. Small volumes of anti-XAF1 antibody vial(s) may occasionally become entrapped in the seal of the product vial during shipment and storage. If necessary, briefly centrifuge the vial on a tabletop centrifuge to dislodge any liquid in the container`s cap. Certain products may require to ship with dry ice and additional dry ice fee may apply. XAF-1 binds to XIAP, an inhibitor of caspases-3, -7, and -9, and triggers its relocation from the cytosol to the nucleus. Overexpression of XAF-1 results in the neutralization of XIAP's ability to inhibit cell death. XAF-1 is normally expressed in all adult and fetal tissues but was found to be present in very low levels in a variety of cancer cell lines. In contrast, XIAP levels have been shown to be high in a majority of cell lines. 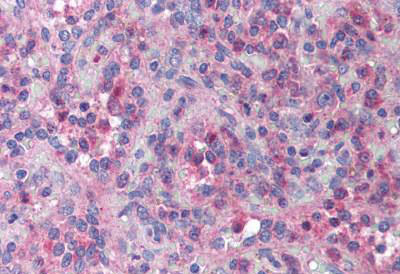 Anti-XAF1 antibody IHC of human spleen. Immunohistochemistry of formalin-fixed, paraffin-embedded tissue after heat-induced antigen retrieval. Antibody concentration 10 ug/ml. 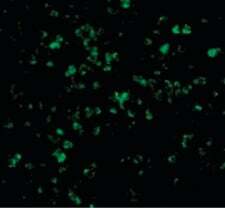 Immunofluorescence of XAF-1 in Human Spleen cells with XAF-1 antibody at 20 ug/ml. Western blot of XAF-1 in human spleen lysate with XAF-1 antibody (IN) at 1 (lane A), 2 (lane B), and 4 (lane C) ug/ml, respectively. NCBI/Uniprot data below describe general gene information for XAF1. It may not necessarily be applicable to this product. BIRC4BP: Seems to function as a negative regulator of members of the IAP (inhibitor of apoptosis protein) family. Inhibits anti- caspase activity of BIRC4. Induces cleavage and inactivation of BIRC4 independent of caspase activation. Mediates TNF-alpha- induced apoptosis and is involved in apoptosis in trophoblast cells. May inhibit BIRC4 indirectly by activating the mitochondrial apoptosis pathway. After translocation to mitochondra, promotes translocation of BAX to mitochondria and cytochrome c release from mitochondria. Seems to promote the redistribution of BIRC4 from the cytoplasm to the nucleus, probably independent of BIRC4 inactivation which seems to occur in the cytoplasm. The BIRC4-XAF1 complex mediates down-regulation of BIRC5/survivin; the process requires the E3 ligase activity of BIRC4. Seems to be involved in cellular sensitivity to the proapoptotic actions of TRAIL. May be a tumor suppressor by mediating apoptosis resistance of cancer cells. 7 isoforms of the human protein are produced by alternative splicing. 1. Transcriptionally active p73 induces translocation of XAF-1 during apoptosis caused by melphalan. XAF-1 directly interacts with Puma and promotes Bax translocation during melphalan-induced apoptosis.